I'm Phil. I've been playing for about 20 years or so and the last 14 at fireball squadron in the West Midlands. I have a strange addiction to pistols and handguns in general and seem to be unable to buy any rifle that doesn't start with an M and end with a 4! Hopefully I'll be able to join in an pass on some of the less useless things I've picked up over the years! He's the current chairman of UKAPU Craig, I'm impressed you recognise the name. Welcome to the forums Phil Sorry if you didn't want your UKAPU status revealing. 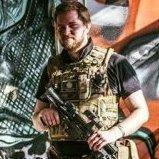 20 years of airsoft experience? That's just about HPA gun era? Thanks Guys and no, Ed, its fine about revealing my UKAPU status it's not a secret and if peeps know who I am and what I do it might help spread the word and get us some more members!